I’ll start with the Heads up. 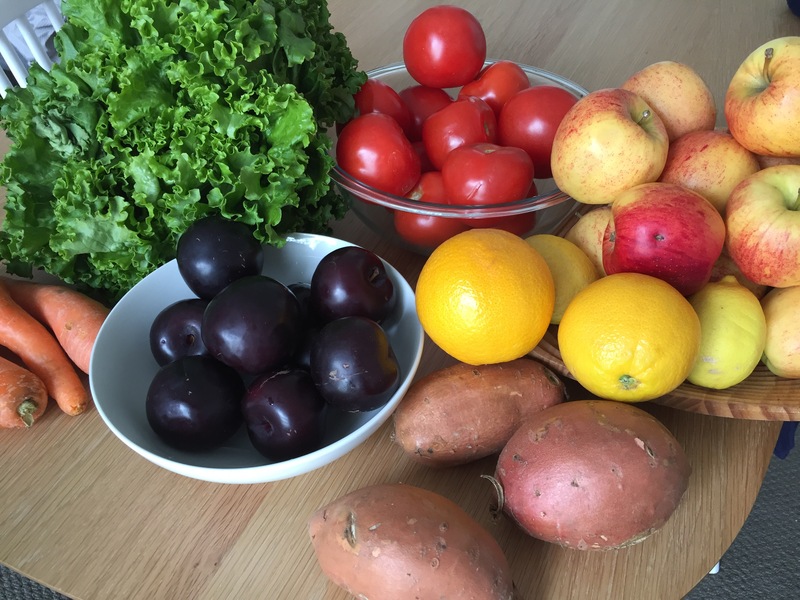 Have you heard of Plastic Free July? It’s a challenge to raise awareness of single use disposable plastic – like takeaway containers or disposable cups. If you’ve been reading this blog and think ‘I’d love to do that but I couldn’t manage’, you can sign up for a day, a week or the whole month. Plastic free July began in Australia in 2011. I’d heard of dry July but not plastic free July until October last year. I’m mentioning it now so there’s a good time to prepare in case anyone wants to dip their toes in the water without committing too much. And if you do and feel like sharing, I’d be more than happy to have a guest blogger for a few days! On that note, we’ll rewind a few months to January. Overall, how’s it been? Pretty good actually (apart from the milk which is not growing on me). I have been lucky because I still have a lot of stuff bought before I started the challenge so I haven’t to deal with too many things at once. Next month it’ll start getting interesting. My plastic free diet isn’t much use because bread and baked goods are easily available in paper bags! To be honest I forgot to weigh myself last night at the gym and couldn’t be bothered going tonight. No other batteries have gone dead, so all good on that front. and this is the last 3 weeks. It’s the wrap from my small packet of Mcvities biscuits and is filled with mint humbug wrappers (sadly now all eaten), a pasta bag wrapper and some cling film from something that was in the freezer. What a difference! 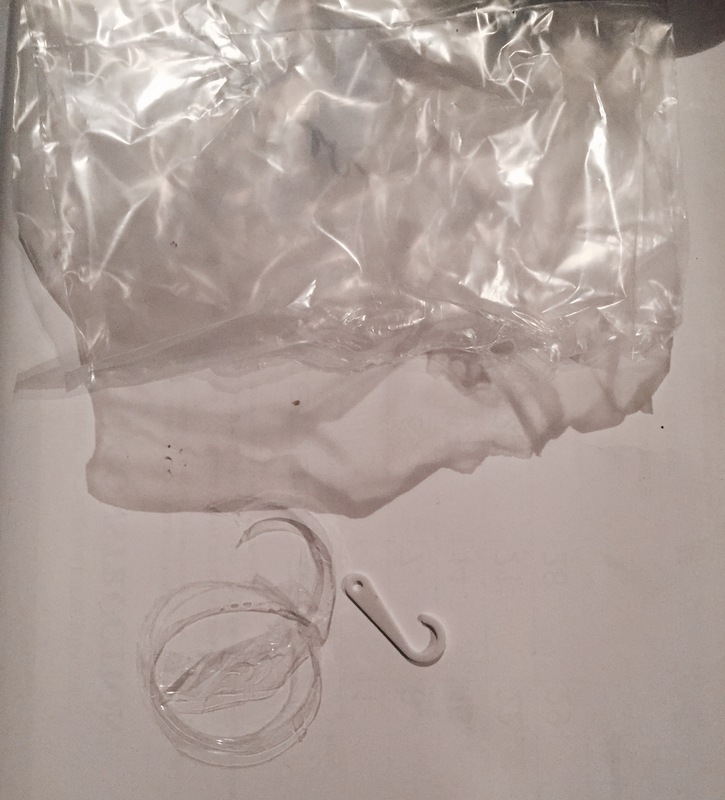 In January I accidentally bought 2 things with plastic – some cotton dishcloths that were rolled up and when I unrolled them, there was a plastic hook (grrr) and the jar of tomato paste that had a plastic tamper proof ring around the lid thaT I only noticed on the way home. The plastic bag is from a newspaper. I spotted it lying on the steps outside work a few days into my challenge and thought ‘Oh, I can use the paper to line my bin’. 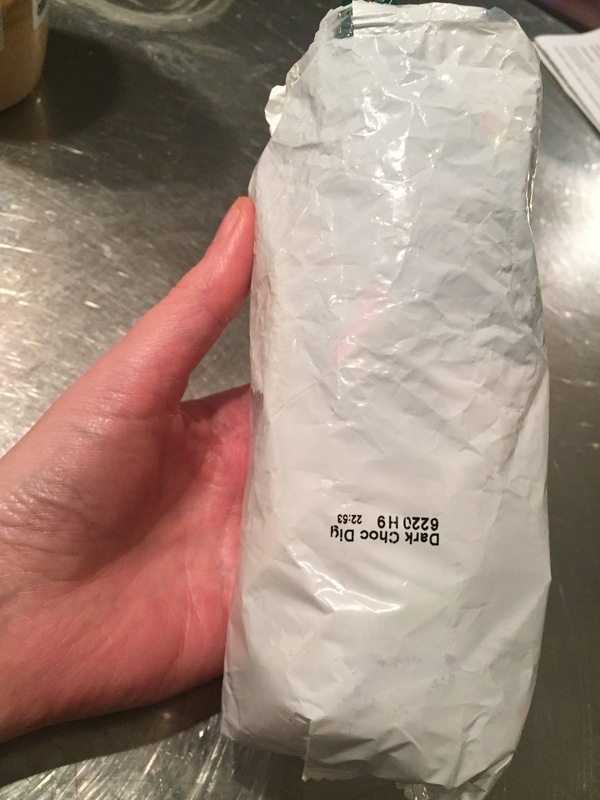 The plastic wrap never registered, which is a lesson in itself. We don’t see packaging anymore – or at least I didn’t until I started my plastic free year. It’s liberating in some ways to walk through the supermarket and not get tempted by interesting packaging. I have overall spent a lot less in the supermarket – 26% of what I spent last January! When you add what I bought in Commonsense Organics and Bin Inn, I’m still down to about 38% of what I spent in the supermarket last January. This might be because I went to the market a couple of times but I’m sure I did that last year too. I need to start comparing prices more to see if I’m saving or just buying a lot less. One thing that is way more expensive is the toilet roll – at $4.99 for 4 rolls it’s 3 times the price of Earthcare where 12 rolls cost the same. I also have to ‘fess up to my apple addiction. I only made it to the market twice because it wasn’t on the first two weeks of January and another Sunday it bucketed out of the heavens. I just can’t manage without apples, so this is my record of the labels acquired from the supermarket. 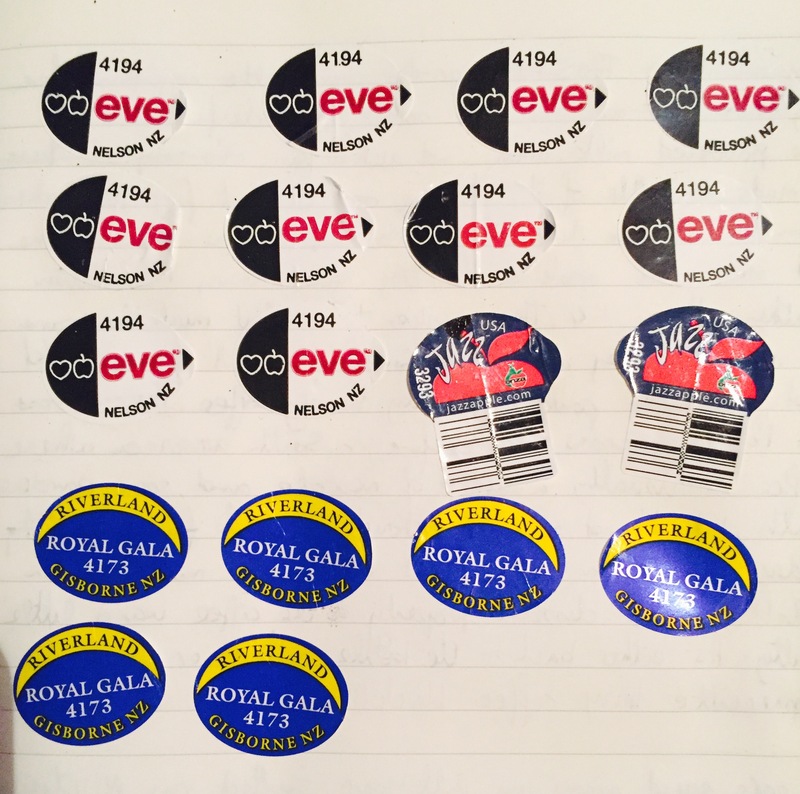 As far as I can gather fruit stickers only really came into force in the 1990s and seem to have been influenced by an EU (or EC as it was then) edict that all food was to be labelled. Given my 2-4 apple a day habit, you can see I have cut back! Thankfully new season, sticker free apples are now available in the market, so I stocked up for week. And tomorrow it’s February – Lá Fhéile Bríde ,which, while it isn’t Spring down in these parts, seems rather appropriate given all the ‘out with the old, in with the new plastic free things’ that February will bring.